Jeff has send me the below pictures and information. woofers, see: www.lambdacoustics.com (click here). 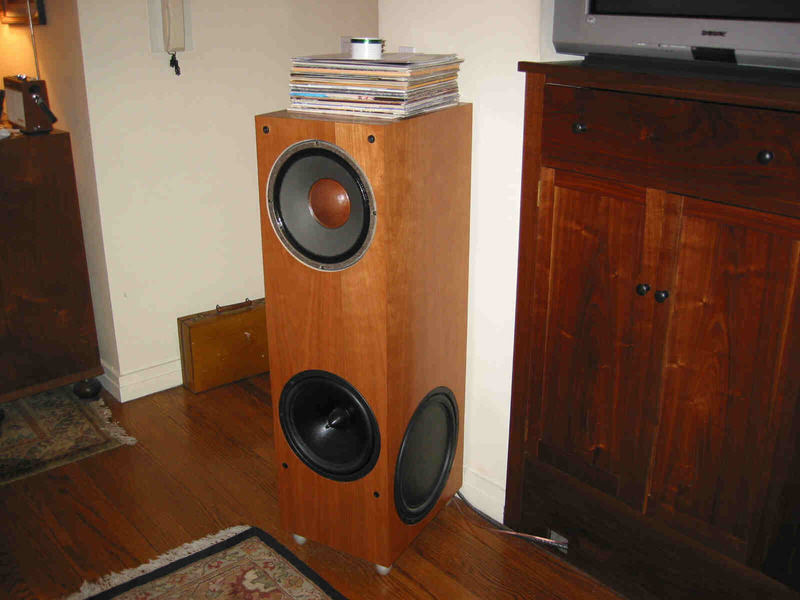 These speakers were a one-off project. and a Lambda crossover for the low bass. I don't know how its filtered. 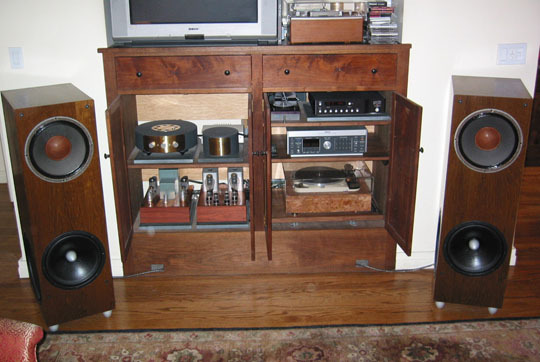 The speakers are closed cabinets with two 15" Lambda passive radiators on each. Any further technical info can be had from Lambda. Actually, the cabinets have changed- Nick at Lambda replaced the original cabinets (which were damaged in shipment) with new cherry ones and I had grilles made to protect the drivers from my son's fingers. Two photos of the new cabinets. Also, a bit of history: these 12" Monitor Reds were originally in Chatsworth cabinets purchased in 1959 by my father from Lyric Hifi in New York City. 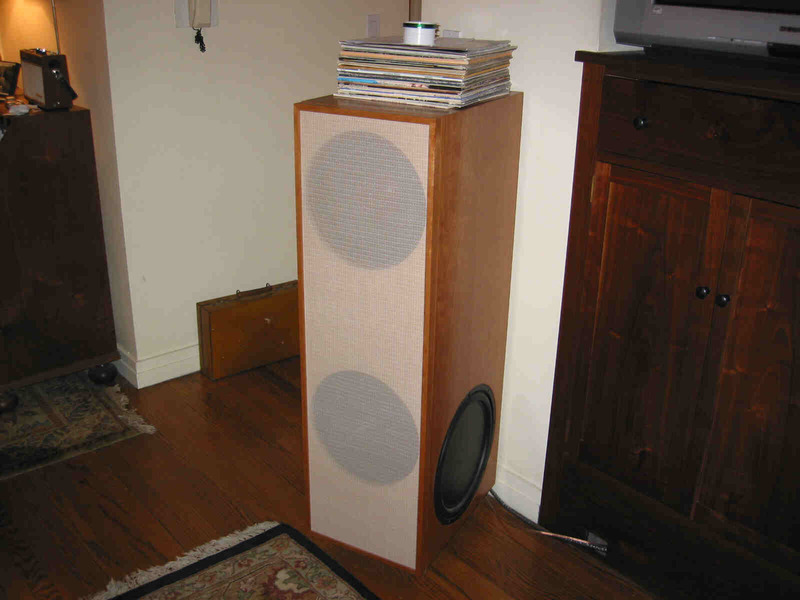 They were sitting in my parents' basement until a few years ago, when my friend Blackie Pagano, one of New York's most brilliant amplifier designers, suggested that I should use them in my system. That's how the Lambda cabinets were born. 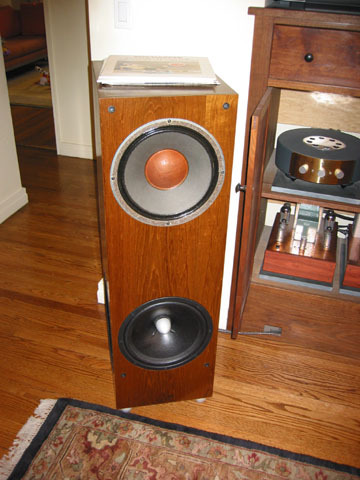 The Tannoys are driven by a custom made 300B amp by Kevin Kennedy, while the Lambda woofers are driven by a 10w chip amp and passive crossover built by Larry DeMartin. The Tannoys will be mated with a 1962 Marantz 7C that Blackie is rebuilding with copper in oil caps and Black Gates in the psu. © PE1MMK Hans Hilberink & Jeff. 2002. Last update 01-04-2003.